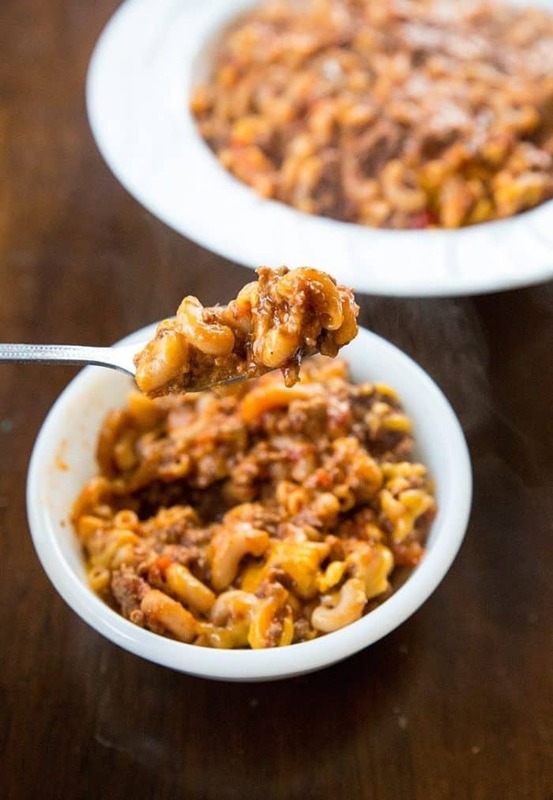 This classic American Goulash is ground beef simmered in a tomato sauce with elbow macaroni, it’s one pot and the entire family will love it! This is comfort food to the max! I am obsessed with American Goulash. 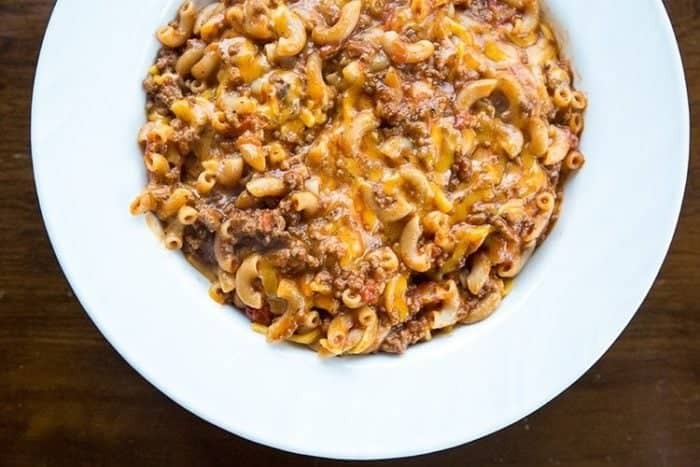 American goulash was never something that I ate growing up as a kid. My parents aren’t huge pasta eaters, meaning that this is something that my mother wouldn’t have made for us. The only pasta I can recall would be spaghetti and meatballs and the occasional tuna casserole. Which reminds me, I am making tuna casserole this winter, I swear. It’s happening. But American goulash? Not in my childhood recipe repertoire. Fry the ground beef in a large stock pot until cooked completely then drain the fat. Add in the garlic and cook until browned. Fry up the pepper at this point if using. Add in all of the remaining ingredients, except the macaroni. Stir and bring to a low boil. Add in the macaroni noodles and stir until mixed through. Cover and simmer on low heat for 20-25 minutes, until the macaroni is soft, stirring once in a while to ensure that the macaroni doesn’t stick to the bottom of the pot. Remove from heat and serve with cheese sprinkled on top. 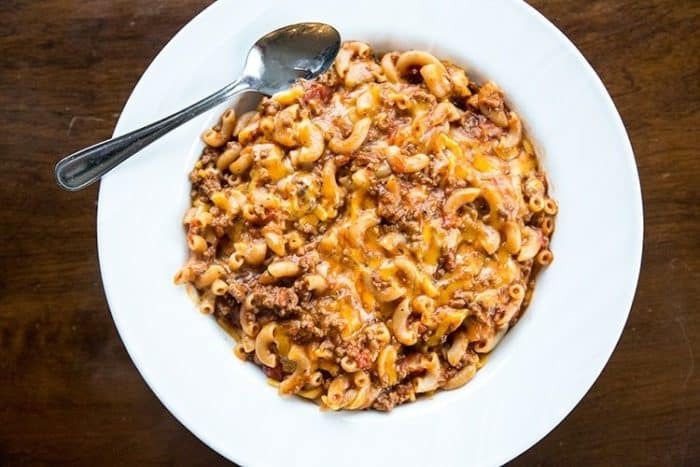 American goulash is called many, many names and I have made an oven version of it using whole wheat pasta – American Chop Suey. 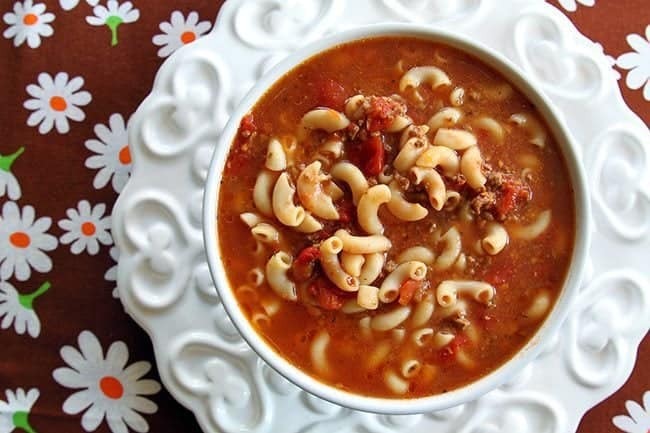 A lot of people have called my Beef & Macaroni soup goulash – but I’m afraid it ain’t so. As you can see, the goulash is thicker, like a creamy casserole and has cheese. Not only that, red peppers can make an appearance and I use a can of tomato soup in the American Goulash as well. The taste profiles are similar, for sure, but other than than they are as different as night and day. And you guys, my ENTIRE FAMILY ATE THIS. Oh my word, that’s a miracle. My daughter, while getting much better, is still a selective eater, however she loves my beef and macaroni soup. Because we’re fancy like that. It really is so darn good and is the perfect meal for winter. 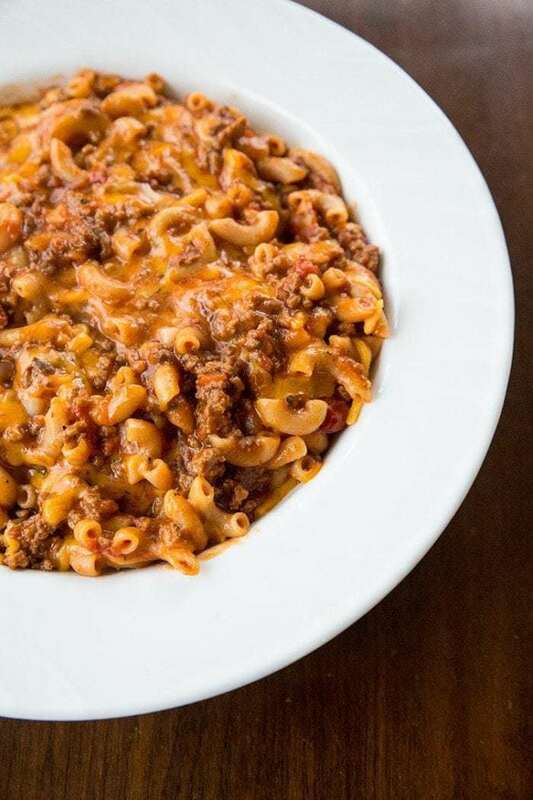 It’s comfort food to the max, with the beef, the pasta and the cheese. It’s also a large enough recipe that our family of four ate it for supper and there was about 3 lunch servings left the next day. You could imagine how irritated my daughter was when she found out that the rest of us accidentally ate it all on her. Oooops. I plead carb coma. 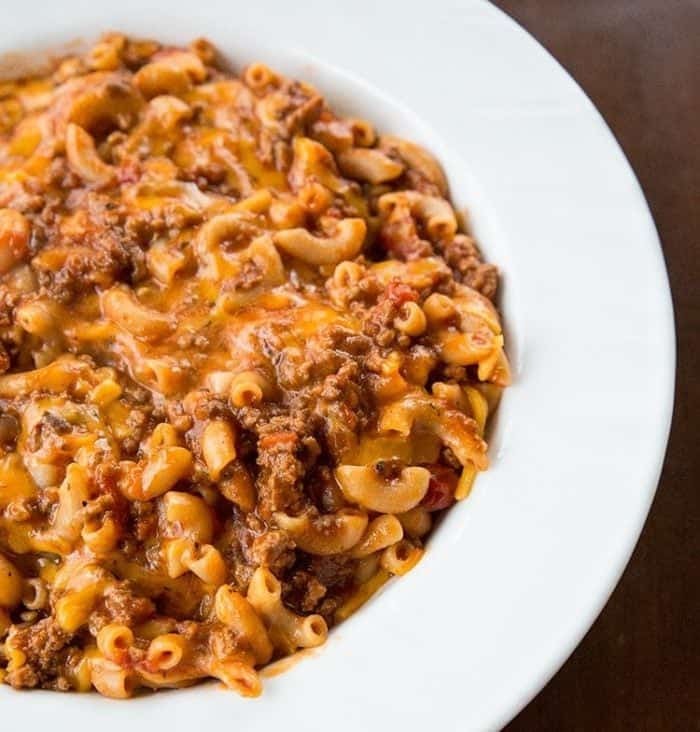 Did any of you eat American goulash growing up? Was it a favourite? Even though it wasn’t my favourite, it is now. This was one big delicious bowl o’ happy. Put this one on your winter menu and let me know what you think! 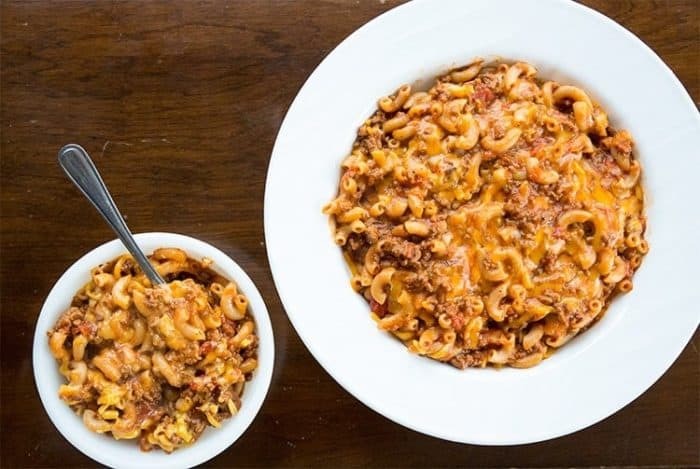 This classic American Goulash is ground beef simmered in a tomato sauce with elbow macaroni, it's one pot and the entire family will love it! This is comfort food to the max! Cover and simmer on low heat for 20-25 minutes, until the macaroni is soft, stirring once in a while to ensure that the macaroni doesn't stick to the bottom of the pot. The sugar in this is the key to reducing that acidic taste you get when you cook with tomatoes. Sprinkle it in and taste test until it's perfect for you! I just made this tonight and my picky eater asked for seconds. I’m putting in rotation, thanks. Make sure to check out my fancy new cookbook and stay a while! Let’s cook together!